One of the highlights of doing Flash Gordon was the opportunity to work with Al Williamson (1931-2010). This first page ran on November 7, 1999. The layout and partial penculs are by Al, the finished inks are by me. This next page is all Al and the last Flash Gordon piece he did that saw print. 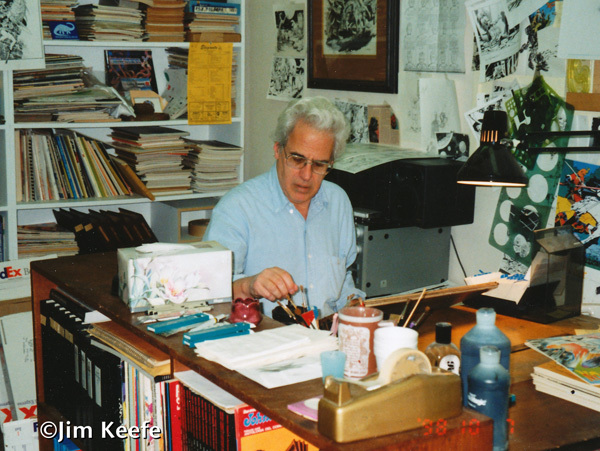 During the summer of 1998 I was working on staff as a colorist at King Features Syndicate. King was gearing up to move from the building it had occupied for decades and I got a tip that a number of old files were being thrown out. I was told that if I was up for it I could go through the trash and keep whatever I wanted as the files mostly consisted of decades old paperwork and files of proof sheets from a myriad of projects/collections that spanned back for years and years. 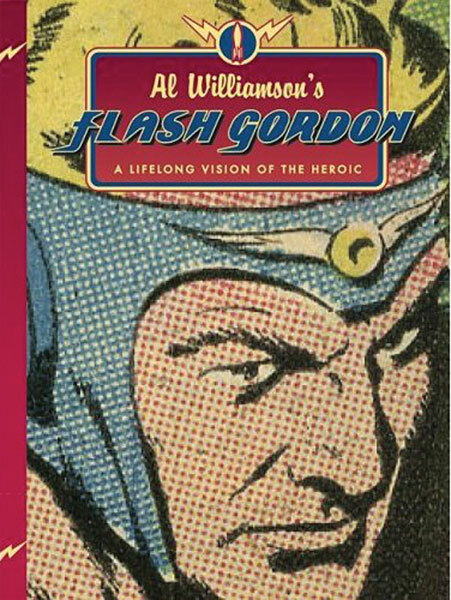 Rooting through the dumpster I eventually came upon a a lost treasure – proof sheets of Al Williamson’s work on Flash Gordon from the old 1960’s King Comics. I could not believe my luck. Now this was around the time that Marvel was withholding artwork from Jack Kirby. That being the case I got Williamson’s contact info from our Comics Editor Tom Daning who had worked with Al two years prior, and – after making copies for myself – sent off the proof sheets. About a week later I got a call from Al. He thanked me, then told me how all the artwork from that first issue of Flash Gordon he had drawn had been stolen years ago. He greatly appreciated receiving the package of proof sheets from out of the blue – so much so in fact that he invited me out to his studio. Al Williamson in his studio inking a Star Wars movie adaptation – October 1998. Since I was the hired hand on Flash Gordon at the time, I inquired whether or not he would be interested in doing artwork for a Flash Sunday page. Granted, I knew he hadn’t had the best working conditions/relations with King in the past, so I was unsure if he’d be up for it. As he was under deadline inking a Star Wars book at the time he politely declined and I left it at that. Al would call me from time to time just to check in on how work was going and how the family was doing. By the fall of 1999 I decided to inquire again if he would be interested in doing a Flash page. At this time he said he’d be up for it, but he had two conditions. 1: That he’d have plenty of lead time. 2: Under no circumstance would he accept payment. He wasn’t able to finish the page due to other deadline commitments, but he did provide a beautiful layout. What follows is the inking study he worked up on tracing paper. Click on to see larger. Williamson’s method of working up a page starts with an inked rough (to size). First laid out in pencil, Williamson then goes over it with ink to start tightening it up. He explained that comic pages he does the whole job on (pencils and inks) he literally ends up inking the page twice. I believe he later changed the figure of Dale because it was derivative of a drawing he had done shortly before this for another project. 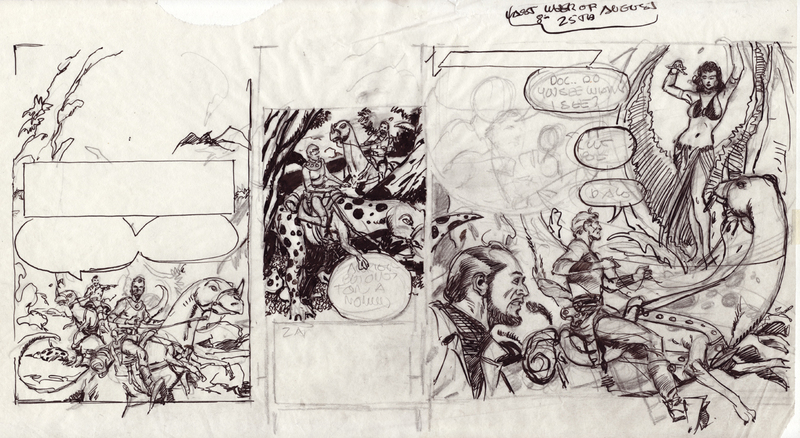 Al blocked in partial pencils onto Bristol, then sent me the tracing paper so I could see what he intended. Due to time constraints he wasn’t able to pencil the inset characters. I can’t say enough about how great a guy Al Williamson was, not just as an artist but as a mentor and friend. For more on Al Williamson’s work on Flash (including these pages) I highly recommend Flesk publications’ Al Williamson’s Flash Gordon. The book includes an essay by Mark Schultz, and the art is beautifully shot from the originals whenever possible. A yearlong subscription to all of King Features’ comics (new and vintage) plus two years worth of archives for every single strip is a pittance at $19.99 a year. Unsure? Try a 7 day trial subscription for free. 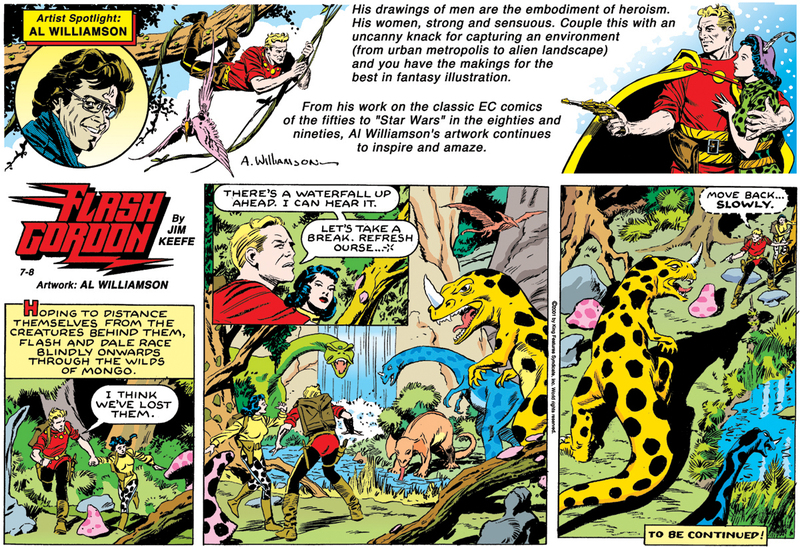 This entry was posted in Al Williamson, Artist Spotlight, Artists - Cartoonists, Flash Gordon and tagged Al Williamson, Flash Gordon. Bookmark the permalink. What a great story! Wonderful that you were able to return the proofs to Al. He was (and continues to be) a great inspiration to me. He was very kind to me when my young wife and I moved to Honesdale all those years ago, and while the timing was bad, he did his best to help my fledgling career along. 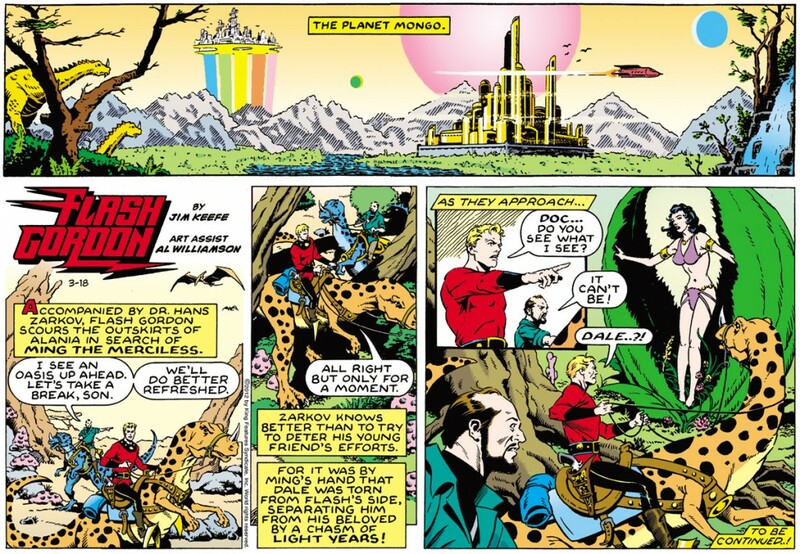 Many years later, my run on Flash Gordon (writing the Sunday strips) was a dream come true. What an achievement for you to get him to draw a strip with you– very cool! TannerI love Dan Barry’s art. He also did two great Indiana Jones series for Dark Horse tordwas the end of his life. Indiana Jones and the Fate of Atlantis, based on the videogame, is great. Thunder in the Orient was a little unfocused, but still fun with great locations, great period detail and great art. The last issue was drawn by someone else, though, I think thanks to Barry’s failing health. Both are collected in DH’s recent Indiana Jones Omnibus Vol. 1 I think. MAYBE Orient ended up in Vol. 2. Al was a wonderful artist and a very kind man. It was great that you asked him to work on the Flash Gordon strip with you. It’s amazing that you shared an artistic experience with him. A precious moment indeed! Thank you for showing all the steps! Your comment reminded me of your Facebook “cartoonist photos” album with all the artists you’ve met; Caniff, Eisner, Williamson and more – great pics!